Today we take a look at one of the very few pieces of Milwaukee Chicks/Schnitts merchandise ever offered for sale. 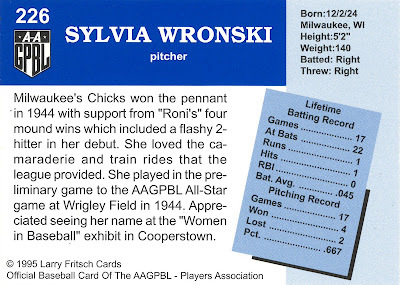 This 1995 trading card depicts right-handed pitcher Sylvia Wronski, and is part of a set of All-American Girls Professional Baseball League cards produced in the mid-nineties by Larry Fritsch Cards, LLC of Stevens Point, Wisconsin. There she is, in her uniform with the distinctive four-lobed Milwaukee city seal. As you can see, Wronski had a remarkably short career. 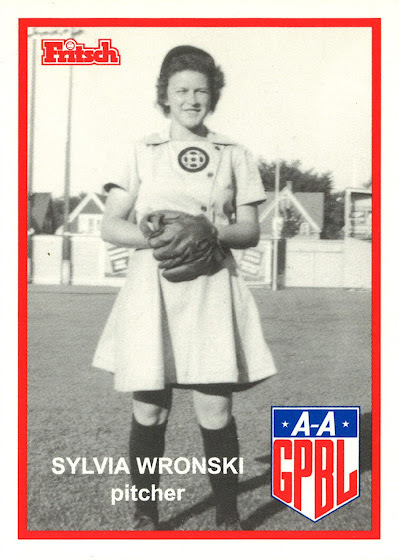 Wronski was signed to a league contract following a tryout at Borchert Field in April of 1944, and was sent to the AAGPBL's combined Spring Training in Peru, Illinois. She impressed the coaches there, but not quite enough to land a roster spot with any of the six teams, so she was farmed out to the West Allis team in Milwaukee's suburban amateur leagues. She was called up after a few weeks in West Allis, and made her debut at Borchert Field on June 30, 1944, pitching a scoreless ninth inning in an 8–2 loss to the Racine Belles. That brief year in the league was also Milwaukee's first (and only) season, and when the team moved to Grand Rapids in 1945 she went with them before being cut early in the season. In 1946 she was offered the opportunity to play for a semi-pro club in Chicago, but chose to stay in her hometown with her fiancé Ed Straka, whom she married the following year. Ed died of cancer in 1954, at the age of 29, and Sylvia went back to work to raise their three children. Even in that short career, Wronski had moments of distinction. She was the starter in an exhibition game the Chicks played at Wrigley Field against the South Bend Blue Sox, a game attended by 16,000 baseball fans. She was only one of two Milwaukeeans to play for their hometown club, the other being Vivian Anderson at third base. Wronski also pitched the last Chicks game at Borchert field, a complete game 4–2 win over the Kenosha Comets, in which she held the Comets to only six hits. The Society for American Baseball Research has a great biography of Wronski written by Jim Nitz; I highly recommend it. If you're interested in these AAGPBL cards, you can order complete sets at the Fritch website. Happy Belated "National Zipper Day"! Last Chance for "Back Yards to Big Leagues"
Turn Ahead the Clock. Again.